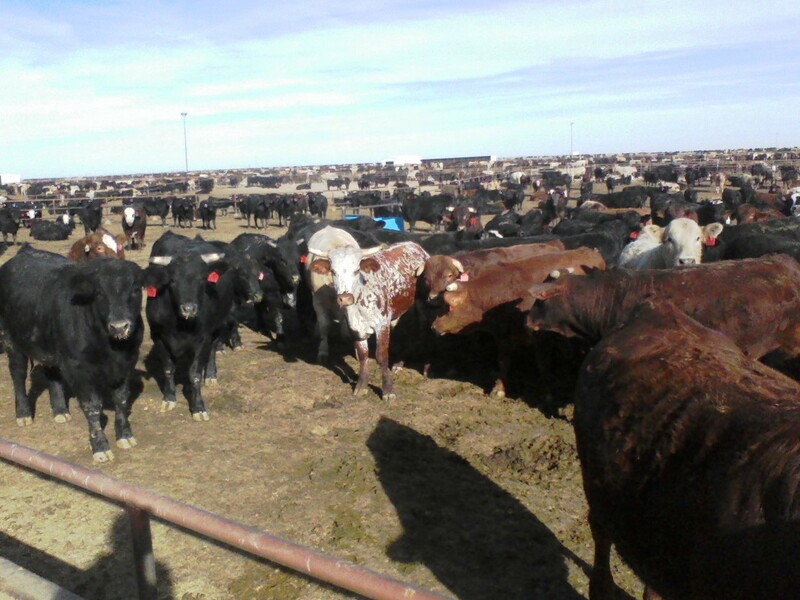 Have you ever worked with cattle from far South Texas? Several of those Gerts are some kinda flighty. Not add on the athleticism of a Longhorn and you have a steer who thinks fences are hurdles on a track field. I spent the entire day trying to keep this ole steer in the feedyard. The slightest bit of pressure and he would flat-footed hop over a fence. Cattle from large ranges, like those found in South and West Texas, have very large flight zones. Imagine a flight zone a bubble around the animal. Step inside that bubble, the animal reacts. Stay outside, the animal does not respond to the pressure. Cattle handlers learn to use the flight zone and point of balance to improve their handling methods. The photo below depicts the position around the animal to get the desired response. If you visit this page on grandin.com, Temple Grandin does a good job of describing Flight Zone and Point of Balance in cattle handling. This ole steer jumped fence after fence, until we finally got three people and directed him into the stock trailer and off to the auction barn. The pens at the feed yard really are not build to keep jumpers in, so it will be less stressful on the steer, not to mention us, in another home. Send in your story and it will get you entered for your chance at a free pair of Justin boots in the AgProud Christmas Giveaway. Enter through December 16 and special coupon code good until December 18. I remember growing up, Dad had a Chi-Simm cross steer on his 100 head total confinement unit, and on our first attempt to send him to market, he cleared the 5′ fence that surrounded the feedlot. He then cleared the barb wire fence to our 80 acre pasture, where he spent the next week calming down. Our second attempt, with gates wired up to make the fence taller, only yielded mangled gates and another week for him in the pasture. Fortunately, the third time WAS a charm as he just walked right onto the trailer (personally, as easily as he went on the trailer that last time, I think he was just bored with us). I heard he cleared a few fences at the stokyard too, but he was out of our hair! Needless to say, Dad stayed away from Chi’s and Simmentals after that. We had an ole Brindle cow that would just plow through us everytime we tried to close a gate on her in the lot. This circus lasted for 3 years. She had her bluff in on us, but eventually we were able to catch her. Needless to say she went straight to the barn. Not a jumper, but I’ve yet to see a cow so mean that other cows were afraid of it. Ten years ago I took over 300 acres of cedars and brush masquerading as pasture, and part the deal was I’d buy the old man’s herd that was on the place. What I got were two dozen wormy cows, and some unworked yearlings. At least he had sprung for a nice steel sorting pen, which turned out handy. I caught the cattle easy enough, they were starving, both for food and a little management. It was then I noticed the large, horned, tiger stripe old cow, alone in one half of the two pen corral. The gate was open between the pens, but none of the other cows would venture into the pen with this beast. Over 1800 lbs, no udder. Horns like a shorthorn, and facing forward. This was the bully of the herd, and the other cows knew it. I doubt she’d been in a pen in years and she was not happy about it. She stomped around that pen like a primitive auroch. We managed to get her sorted, and in the pen at home. I was going to haul her to town, and dad asked that I take three large yearlings that he had no place for. I loaded them all together, I didn’t want to deal with her alone. Two miles down the road, I look back into the trailer because the load is shaking pretty bad. She’s got a yearling up off the floor of the trailer, up against the front, driving into him with all she’s got. At this point I’m convinced I’ll have a dead, gored calf to deal with. I get to the sale barn, and I of course warn the cowboy there that that cow is crazy, so watch out. He gives me the jaded “yeah, whatever…” as he opens the gate. I never even looked in the rearview, I didn’t want to know what happened next. Haha, that’s kinda the feeling I had when this ole steer left the yard. He’s not my problem anymore. Who ever bought him will get a surprise at home if they don’t have tall fences.